It began with a coin purse. Hello Kitty, soon to conquer the world, made her debut on a tiny coin purse made from see-through plastic. The year was 1975. The “Hello! Exploring The Supercute World Of Hello Kitty” exhibit at the EMP Museum includes a replica of this coin purse. A replica, because out of all those tiny coin purses produced 40 years ago, only one is known to still survive. 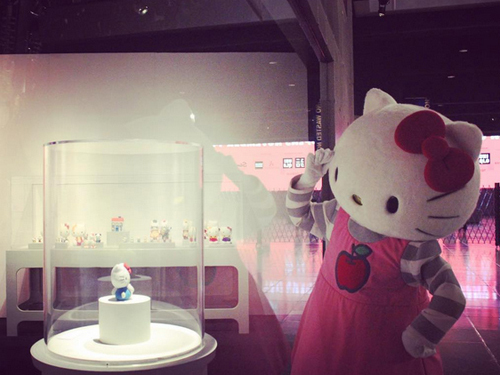 It’s kept locked up tight in the vaults of Sanrio, Hello Kitty’s parent organization. And over the next 40 years, what Hello Kitty and/or one of her stylized cartoon friends hasn’t graced, would probably make a shorter list. Calculators. Notebooks. Electric fans. Hair dryers. Cellphones. Gum. Candy. Cars. Bicycles. Motorcycles. Jet airliners. Feminine hygiene products. Toilet. Motor oil. A Hello Kitty maternity ward opened recently in Yuanlin, Taiwan. You’ll also find Hello Kitty in certain circumstances not strictly authorized by Sanrio. An enormous statue of Ms. Kitty (or Kitty White, if you prefer the formal name) as an android space warrior graces the EMP. 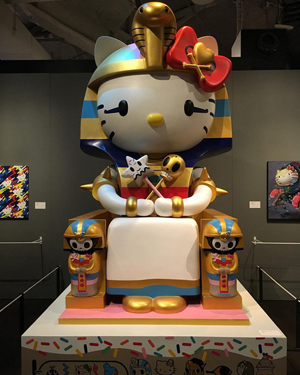 So does a sculpture of a Hello Kitty sphinx, straight from some phantasmagoric vision of the Egyptian desert. Hello Kitty has been worn by everyone from Lady Gaga to Paris Hilton to Katy Perry (who apparently went so far as to get Kitty White’s face tattooed on one finger). Sanrio representatives make it clear that these celebrities aren’t paid by Sanrio. They just love the Hello Kitty action. 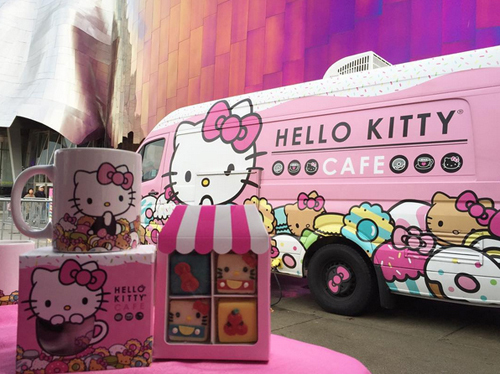 “Sanrio and Hello Kitty’s Japanese heritage are defining factors for the brands,” elaborates Sanrio’s Dave Marchi, vice president of brand management and marketing. 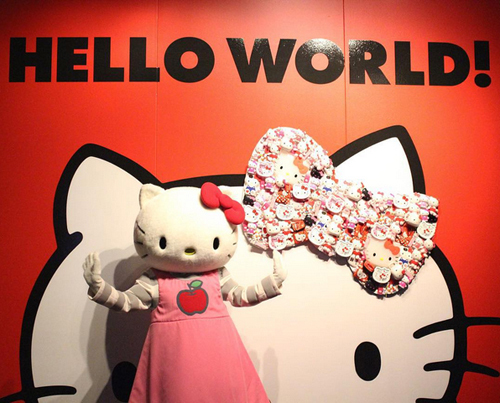 “For many U.S. citizens, Hello Kitty is often described as the first introduction to a Japanese brand.” In this way, Ms. Kitty White helps bridge the two cultures. She has a pet cat—yes, the anthropomorphic kitty has a kitty—and the pet kitty has a pet hamster. I asked a Sanrio rep if the pet hamster was getting a pet. He told me no plans yet, but you never know…. And at the end of the Hello Kitty trail sits another huge sculpture, this one resembling a huge gumball machine or transparent bank. 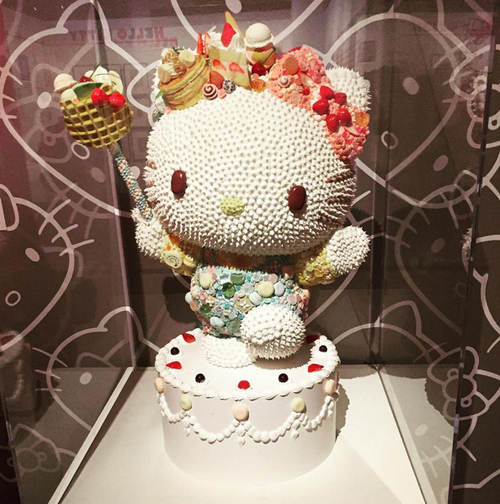 Crafted by sculptor Sebastian Masuda, the sculpture is hollow, and exhibit guests are invited to fill it up with their own Hello Kitty memories. Then the sculpture, along with several others like it, will go on exhibit at the Tokyo 2020 Olympics. “Hello! 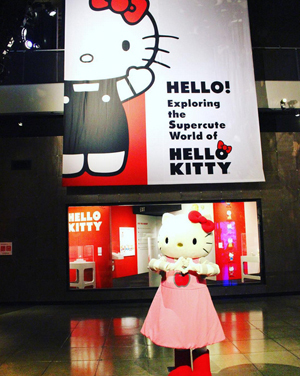 Exploring The Supercute World Of Hello Kitty” is on exhibit currently at the EMP Museum, 325 5th Avenue North at Seattle Center. For prices, hours, and more information, visit: http://www.empmuseum.org. Exhibition ends May 15. After I initially left a comment I seem to have clicked the -Notify me when new comments are added- checkbox and from now on every time a comment is added I recieve 4 emails with the same comment. There has to be an easy method you can remove me from that service? Cheers!